Just call Rosa's name. And wherever she is, she'll come running. 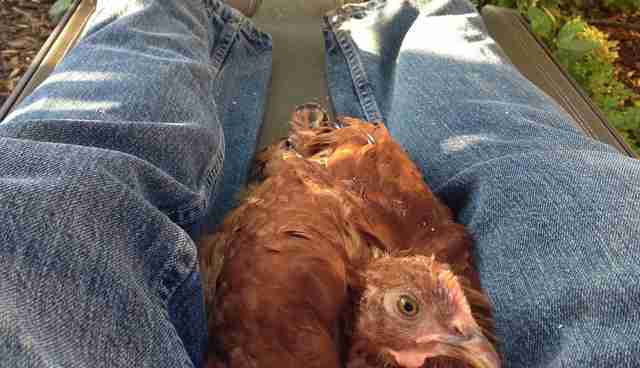 That's how much this hen loves the human who saved her life. Robert Grillo tends to have that effect on chickens. The author of "Farm to Fable: The Fictions of Our Animal Consuming Culture" has rescued many an animal from some very bad places over the years. But he's never known a bird like Rosa. Two years ago, not even Grillo could imagine Rosa running. Much less even on her feet. In July 2015, a woman spotted her on the side of a busy Chicago street. 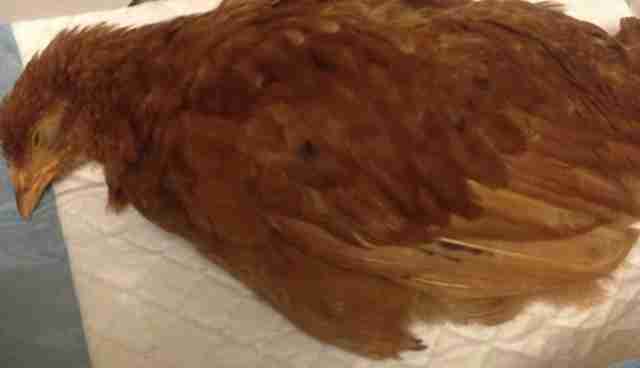 The hen was toppled over, a heap of feathered hopelessness. She sent a picture to Grillo - and he confirmed the hen wasn't long for this world. 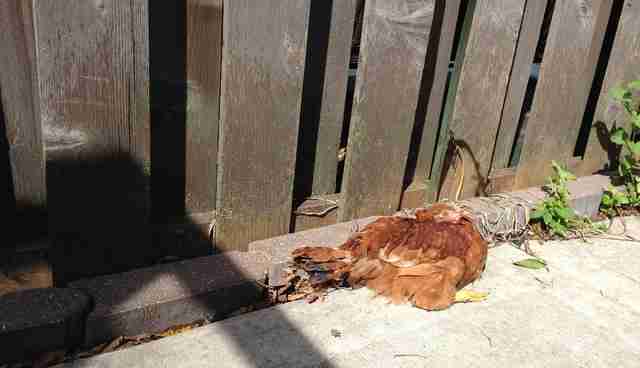 "I've seen a lot of chickens lying on their side and that's a very sure sign that they're about to die," he tells The Dodo. "I told this young woman, 'I'm really sorry, but she looks like she's going to be going any minute.'" The next morning, "much, much much to my surprise," Grillo got another update on Rosa. "She was on her feet. She was eating," Grillo explains. "She looked like she really came around." Not long after that, Grillo picked up Rosa and hurried her to a veterinarian. 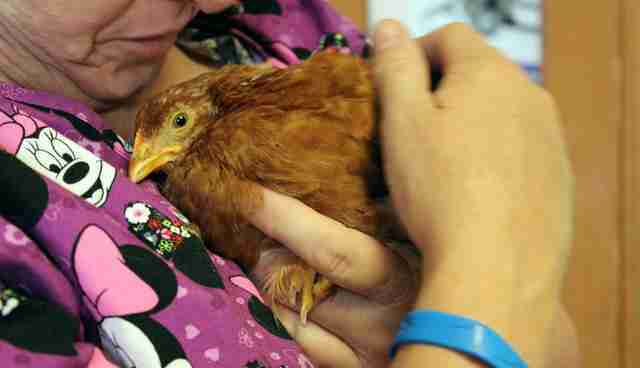 Just six weeks old at the time, Rosa was likely a runaway or castaway from an egg-laying operation. At many commercial egg farms, hens like Rosa are forced to lay about their own weight in eggs every 25 to 30 days - a burden so taxing on their bodies, they usually don't live very long. "You can only imagine what that does to them," Grillo notes. "It causes all kinds of internal problems. 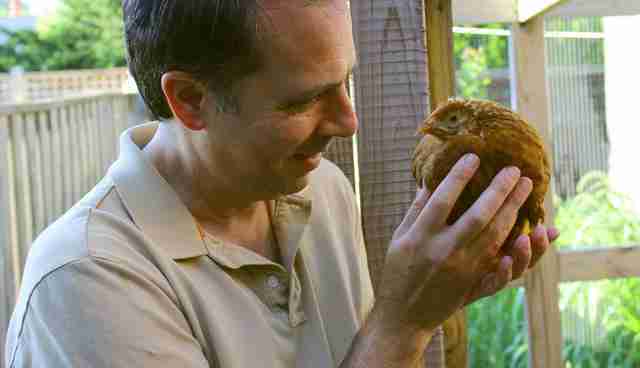 Egg-laying destroys their bodies at a very young age." "The eggs they lay is a function of intensive selective breeding, so regardless of where or how they are raised, they can't control this. I often use the expression, 'they are prisoners in their own bodies.'" And sure enough, Rosa bore the telltale signs of life under a factory yoke. 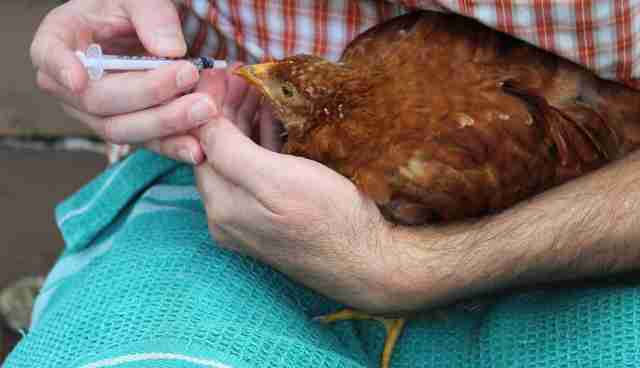 She was weak, likely the runt of the flock - and she had a serious spinal deformity. "She could have been deliberately abandoned because she was found to have a defect," Grillo says. Typically, when people call Grillo about animals in need, he relies on a network of potential adopters through his organization, Free From Harm. 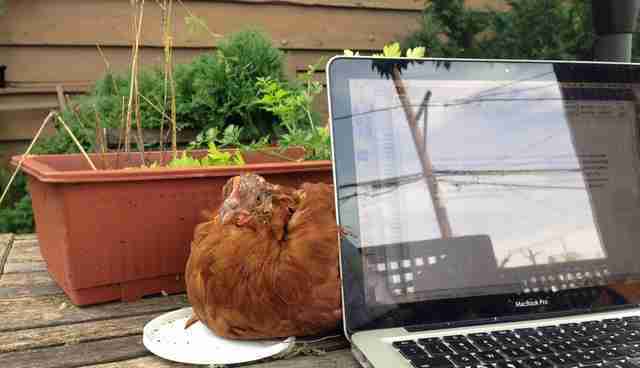 But this hen wouldn't dream of leaving her human. "Rosa really took a liking and an attachment to me," Grillo says. 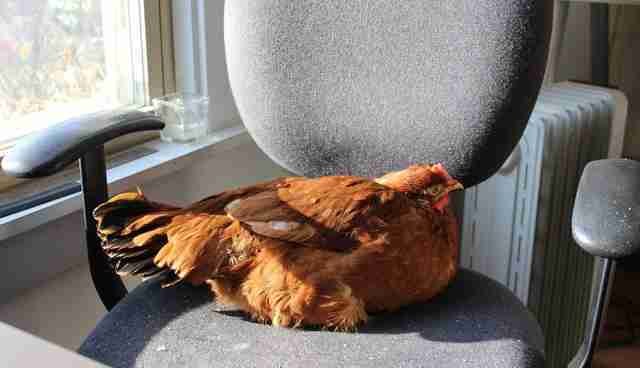 And this plucky hen also showed a zest for life. 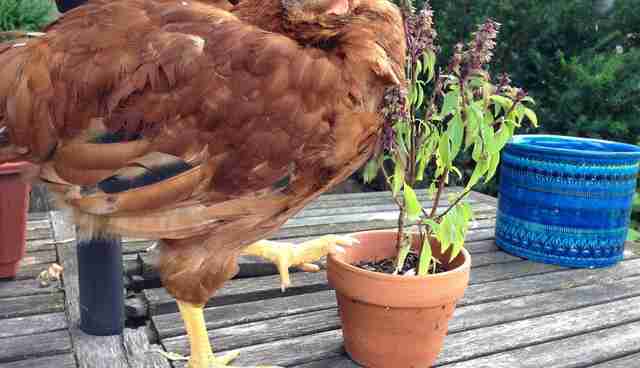 Around Grillo's Chicago home, she's often found pecking at the basil plant. And even taking a literary turn. But, mostly, she wants to be wherever her favorite human is. 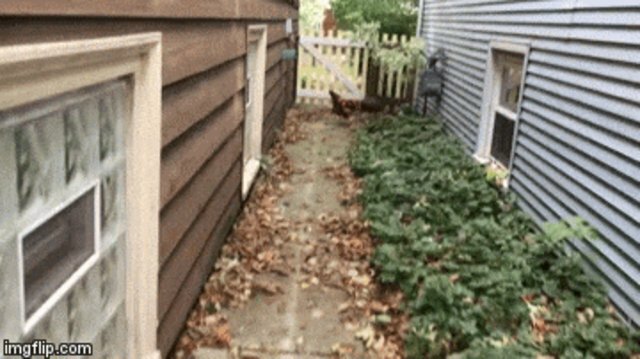 It turns out, knowing her name and coming when called is child's play for chickens, who are much brighter than given credit for. "She's not the first to come when called. (Chickens) are incredibly connected - like other chickens I've had really close companionships with. They follow you everywhere." 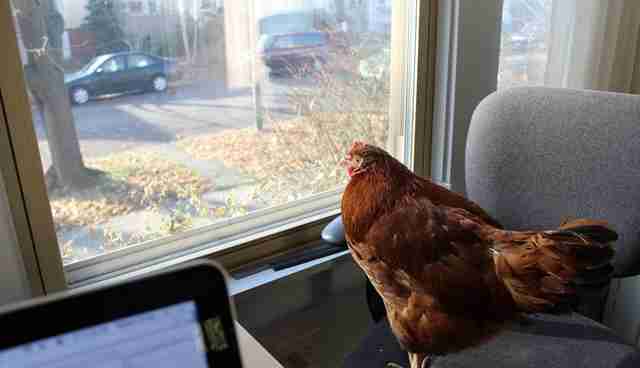 But this hen has found the best perch from which to keep an eye on her favorite human. If you would like to learn more about Robert Grillo's work with animals and education, visit Free From Harm.